I can’t find the remote to my DVD player. There have also been numerous times where couch pillows have gone flying in search of the TiVo remote (only to find it mysteriously on the bookshelf in the office.) My stereo system has a remote control that’s smaller than a deck of cards and had virtually no chance of being around after the first two months. Thanks goodness for Logitech and their amazing Harmony One Advanced Universal Remote. With remotes for the TV, cable box, surround sound, DVD player, stereo and all your other living room gadgets, things can get pretty cluttered. This holiday season, stop searching for all your remotes and find out how one touch simplicity changes everything with the Logitech Harmony One Universal Remote. With a full color touch screen, control of up to 15 devices and one-touch “activity” controls, this is the only remote you will ever need. The “activity” feature lets you create custom settings across devices, where you can select “Watch TV” or “Play PS3,” and Harmony will turn all the right devices on in the right order. Harmony works with over 225,000 devices and is rechargeable so you’ll never have to search for batteries to watch TV again. Whether you’re shopping for a gadget guru or simply a TV-lover, the Harmony One is the perfect addition to every living room. Now, when I first think of universal remotes, I think of big, clunky remotes that have big numbers and maybe a 50% chance that the remote will actually work with all of the components in my house. If it could control the TV, it couldn’t control the stereo. If it could control the DVD player, there was NO WAY that it would be able to control my iPod speakers. 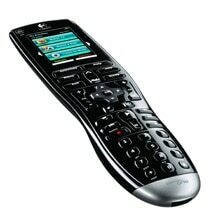 Logitech’s Harmony One Advanced Universal Remote truly is the leader in remote technology. With touch screen functionality and the ability to program different activities that will automatically set every component how you want, it is unmatched when it comes to complete and utter remote control AWESOMENESS. 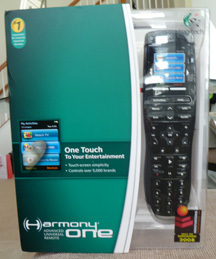 The Logitech Harmony One comes with a charging station, a USB cable, and an installation CD for setting up your remote. To set-up your remote, you simply plug your remote into the computer via the USB cable. 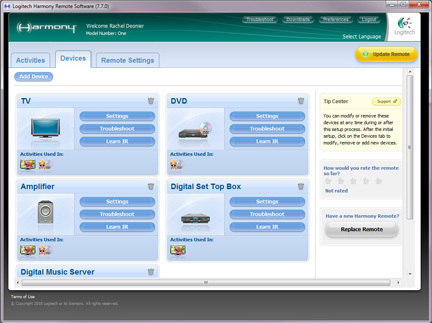 When you run the installation CD, it will install the Logitech Harmony Remote Software. FYI, the software is Mac compatible as well, so it should work for all computers. Simply create your account and then start adding devices. 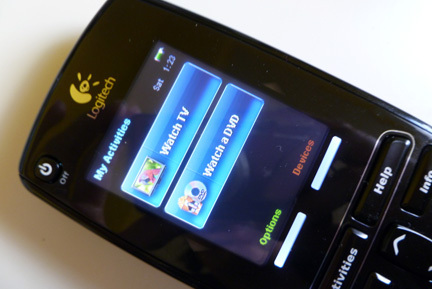 To add a device, you select the type of device (such as Television, Game Console, etc.) then the manufacturer and model. With a database of over 225,000 devices, you’re virtually guaranteed to be able to find your device listed. However if it isn’t listed, you are still able to manually program your remote by syncing it with your old remote control and having it “learn” your old remote’s signal. Amazing. There will be a verification process where you click matching buttons to make sure that all of your buttons work properly. After you have your devices added, then you’ll want to program your activities. First you select the type of activity, such as Watch Television. It will step you through a series of questions to determine how you want your system set-up. You can select what settings the TV should be at (such as your input source) and can select the channel for the TiVo while also selecting the channel for the speakers. After everything is set-up properly, the remote will save your new activity for easy one press access to control all of the components. Here are my settings for “Watch TV” and you can see that it is turning on my TiVo, TV and speakers while turning everything else off. 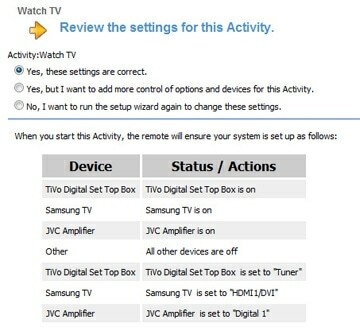 Then it sets the TiVo, TV and speakers to the right settings. All automatically. Essentially, if you had to use three different remotes to get your television set-up just right, now all you have to do is press the “Watch TV” button on the touch screen. That’s right – TOUCH SCREEN. The screen is brightly lit, full color, and responds to the touch of a finger, allowing you to choose your activity, or even control the devices manually if needed. After setting up all of your devices and activities, you can unplug from the computer and start using the remote. From one seat, I’ve been able to turn off my iPod speakers to watch TV, or turn off the DVD player and skip to the next song on the iPod. One seat, one remote, one touch screen press. Another great benefit to the Logitech Harmony One is that the batteries are rechargeable and are easily recharged by placing the remote on the charging station. This not only gives it more juice, but also creates a dedicate spot for the remote, one of the best ways to reduce remote control loss. Co-workers have talked to me about this remote, friends have oohed and aahed it, and I’ve already bought one myself. Really there is no better way to end this review other than with, “I love the Logitech Harmony One.” It is a truly amazing product that is the perfect gift for anyone who has multiple audio/visual devices in the home. It reduces clutter and remote control loss and make it a snap to quickly watch DVDs or turn off the TV to listen to the music – all with one remote. It’s MSRP is ~$250, but it’s currently on sale on Amazon for $160.99, so it’s a good time to buy it now to give to that special someone for the holidays. I sure hope my dad isn’t reading this post because this is what he’ll be getting. One winner will receive their very own Logitech Harmony One Universal Remote! favorite feature is the full color touch screen. I love the full-color touch screen, backlit buttons and an ergonomic design make it easy to get to my show—even in the dark. I Love Clutter control! We have 3 remotes to use and it’s stinks! Especially when you can’t find one. Also, love the touch screen! I follow Logitech on Twitter @Mom2LinzNOkie and I also “like” them on FB: Tonya C.
I also “Like” WIC on FB: Tonya C.
I love the color touch screen. love that it has rechargeable batteries! Lithium-ion battery is a great feature, I love rechargeable devices! I follow logitech on twitter! I like subscribe via google reader! Fb fan of the wic project! I love the touch screen and that it would eliminate about 6 remotes! I love the touch screen! My remote drives me nuts when I want to watch a DVD sometimes I just give up on it. This would make things ALOT easier! OMG they can put a screen in anything now! Anyway I love the fact that it can work for 15 devices and can recharge. The idea of never having to buy batteries again for one remote, let alone the 20-ish remotes I have, ever again gives me the giggles! The Logitech Harmony One can replace 15 different remotes so it would clear off the end table of all of my husbands remotes! I’m a WIC Project email subscriber. I follow WIC via google reader. I like that it removes all the remote clutter- we have 5 remotes now. The color touch screen and the fact that it lights up in the dark. We don;t watch ALOT of TV at night but when we do we have to turn on the lights to see whats going on! This remote is fabulous! My favorite feature is the full color touch screen. I follow Logitech on twitter. THANKS!!! for the AWESOME!!! GIVEAWAY!!! I liked Logitech on facebook. THANKS!!! for the AWESOME!!! GIVEAWAY!!! I love that it can replace 15 devices. We have 3 remotes right now and most the time we’re lucky to find 1 which is frustrating, it would be nice to just have 1 for all. I also love that its rechargeable. I love that it has a full-color touch screen! Like you on FB Suzana! I like the fact that it is so easy to program. I would bet that even I could do it. control many electronics with one controller. I like that it is lighted so it will be easier to use and find. I like the color touchscreen, and the fact you can program favorite channels, features, and devices on the computer. I like the backlit buttons, and that it would replace the clutter of controls currently in the family room. The A full-color touch screen, backlit buttons are a must. So good to have on this remote. My cable remote is a real hassle in the dark to deal with. I like the backlit buttons that make it easier to see what you are doing. I like the backlit buttons. I like that you can control all your devices with the one remote. I love the touch screen!! I love how it states there is simple packaging, comes in a brown box. Yay! for no plastic if this is true. Majic Touch and Lighting the way are my favorite features. The full color touch screen. I have to use three remotes to change to tevision, video and record. This would help out a technical impaired family. I like the fact that it is compatible with so many different electronics! I have an 880 that’s crashed. This one would be great! I like the fact that it works with 225,000+ devices. I like that I will only need 1 remote for tv, dvd, vhs and tuner. I like the backlit buttons and the touchscreen. This remote will help my mother in law, who house sits for us, work our tv. I love hitting one button and having everything turn on/turn off, switch sources, adjust inputs and the magically be what I want it to be to watch a movie, TIVO or play some Mario. Truthfully, I’d just be happy to have a remote that actually works for everything. At the moment, I have to either pick between having a ton of remotes, or using a cheap universal remote that doesn’t work that well. I have also followed Logitech on Twitter. I like that you can get rid of all of your other remote controls. I like that it has a full-color touch screen, backlit buttons and an ergonomic design ! I subscribe to The WiC Project via email and “Like” The WiC Project on Facebook. I like Clutter Control feature. A full-color touch screen, backlit buttons and an ergonomic design make it easy to get to your show—even in the dark. I like how easy it is to program. I like the clutter control and the one touch feature! I followed @Logitech. My twitter handle is @dlrayburn. I subscribed to WIC’s RSS feed via email. I like the Guided online setup. According to the website, you connect your Harmony remote to your computer and you’re guided through every step. If you hit a snag, customer support is ready to help. That would be a nice change. Thank you for the great give-away. Favorite feature is t has a full-color touch screen, backlit buttons and an ergonomic design make it easy to get to your show—even in the dark. I or “Like” Logitech on Facebook and posted on their wall you sent me. I like the full-color touch screen! I follow logitech on twitter (pickledseeds). I like that it helps control clutter. I love that it has a full-color touch screen, backlit buttons and an ergonomic design make it easy to get to your show—even in the dark. Which I sure can use because I can never see the buttons. I “Like” Logitech on Facebook and posted on their wall you sentme. obviously i love there is only one remote for everything and it turns everything on in the right order – clutter control! My favorite is the backlit buttons!! I never get to watch much tv until after the kids are asleep. When we do watch it, it’s in our bedroom in the dark. Backlit buttons would be so awesome! Oh, and the touchscreen of course! I like that it’s rechargeable and can learn so many remotes automatically! Rechargable batteries and the color screen are tied at the top of my reasons for loving this remote. I like that the remote controls up to 15 video, audio, and gaming components. I love that it is a touch screen which makes it so easy to use! I am following Logitech on twitter as ptowngirl. I love the touch screen, I think that’s the coolest aspect of this remote. I like the Help Button, mostly because I’m not a savvy tech person. That will come in handy when setting it all up to all my devices. i need this bad boy to clean up the clutter in my living room. Clutter control! The feature I like most is I’m almost positive that it would work with our speaker system so we could finally use it also that we would only need one remote for everything. The features I like most are its ergonomic design and size. That makes it easy to hold and operate for everyone, even smaller hand size people. I like the backlighting so it can be used in a darkened room also. Touch screen is pretty awesome sounding. I like how you can replace all of your remotes! My favorite feature is the learning mode – on the off chance I have a device not in the database, I can still use this remote for it. Thanks! I love that it replaces the other remotes, we are always losing one of them. I love the full-color touch screen the best, thanks for the chance! I love that it controls many different areas at once. No more guessing which remote works for each item! Love that it’s rechargeable and has a full color touch screen! Following Logitech on Twitter as silentplatypus. i love the screen…looks so user friendly! The touch screen on this is awesome. Such a cool remote! I love the use of the charging station! Full-color touch screen and an computer guided st-up, this remote is a sure winner. Thanks for the chance to win. The fact that it can get rid of my 5 other remotes is the most exciting feature I can imagine! I love that it has backlit buttons. I love that it works with EVERY device I need it too and that I only have to try and keed one remote away from my kids instead of 4! 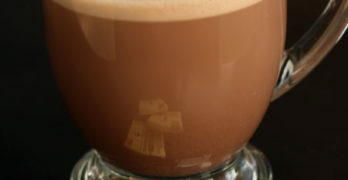 mndjhrmn likes the Wic Project on Facebook! And I love Logitech universal remotes! What isn’t great about them??!! LOVE the touch screen!!! how cool!! A full-color touch screen? I love it! I’ve never heard of such a thing on a remote. Technology is amazing! I definitely love the backlit full-color touch screen (since our living room is pretty dimly lit and we love to watch movies in the dark) and that fact that it’s compatible with 5000+ brands and 225,000+ devices. Thanks! I follow Logitech on Twitter as NeraCaligula! The best that it can do the job of 15 different devices-so totally cool! I love the touchscreen and the amount of remotes it can replace. Love the fact that the Logitech Harmony Remote can reduce clutter…great aspect on its own! Love the touchscreen, and that it can control up to 15 audio, video and gaming components! WOW! My favorite feature is the color touch screen and how it would replace all the remotes we have! I love the backlit button features. I usually watch tv in the dark, so that would come in handy. My favorite feature is the touch screen!! You connect your Harmony remote to your computer and you’re guided through every step. If you hit a snag, customer support is ready to help. My favorite features are: Rechargeable, and the fact that the remote replaces 15 remotes! My favorite feature would be that it actually controls everything, rather than having a bunch of different remotes. I purchased a lower cost Logitech Harmony and love it . Wanted to buy the one you reviewed because I like buying the best and I liked the touch screen but I couldn’t afford it. It’s definitely worth buying if you have a lot of units that use remotes. Great review!